At the time of the announcement Paul Foster, Chairman of the Board of Regents, said the money available to the Board allows the System to do something other universities might not be able to afford. 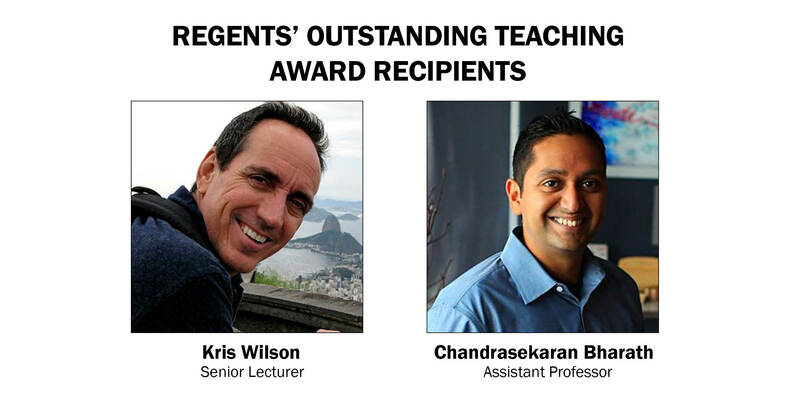 The Regents’ Outstanding Teaching Award was established in 2008 to recognize educators who perform at a high quality of instruction in the classroom, the laboratory, in the field or online. Before they were selected, the nominees sent in their nominations and submitted a 150-page portfolio containing student evaluations, their teaching philosophy and letters of recommendations from students and peers. Award recipient Bharath Chandrasekaran, assistant professor in the department of communication sciences and disorders, said he appreciated his students’ help during the process. Kris Wilson, senior lecturer in the School of Journalism and a recipient of the award, said he thought it was fascinating to talk with other winners and see that everyone had the same goal of wanting their students to know the maximum amount they could. Leslie Adami, a journalism senior, said she had Wilson for Audio Storytelling and Reporting on the Environment. Wilson encourages his students to challenge themselves, Adami said, and she remembers that philosophy before leaving on an internship.